Business and belief, so often painted at odds are inseparable for Graham Dacre whose book is filled with faith and wisdom. Starting with nothing in the mid-seventies, Graham Dacre built one of the most notable motor trade businesses in the UK, at its peak turning over half a billion pounds. Alongside this, he has grown a significant property portfolio and has been honoured by the Queen for his philanthropic investment into the lives of young people. He is known for his directness, his risk taking approach to business, and as a man committed to living generously. But inseparable from Graham Dacre the businessman, is Graham Dacre the man of faith, who from day one has allowed God to be the centre of all he is and all he does. This is his story -- which contains some big ups and downs -- but this book is more than an engaging, fascinating life story. It serves as a handbook for would-be entrepreneurs and is full of hard-won wisdom on how to develop the character and skills of a successful entrepreneur. 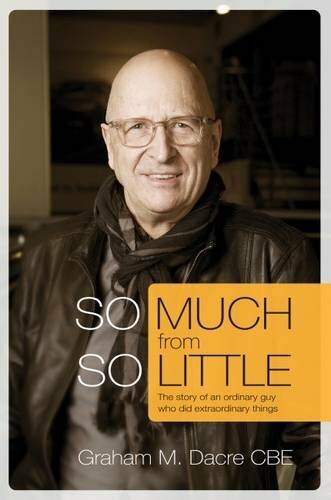 So Much from So Little by Graham Dacre was published by River Publishing in March 2016 and is our 17341st best seller. The ISBN for So Much from So Little is 9781908393579. Be the first to review So Much from So Little! Got a question? No problem! Just click here to ask us about So Much from So Little.